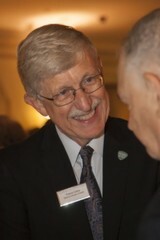 Dr. Francis Collins, Director of the National Institutes of Health (NIH) at the ceremony for the 2017 Lasker-DeBakey Clinical Medical Research Awards. Among the recipients were Drs. Douglas R. Lowy and John T. Schiller of the National Cancer Institute (part of NIH), for their significant research leading to the development of human papillomavirus (HPV) vaccines. The award is the country’s most prestigious biomedical research prize.